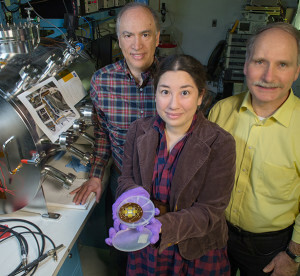 John Hagopian (left) collaborated with instrument scientist Lucy Lim to develop a new instrument that relies on carbon nanotubes to provide the electrons needed to excite minerals contained in an extraterrestrial sample. Larry Hess (right) patterns all the leads and patches where the catalyst for growing nanotubes is deposited. In the most recent application of the carbon-nanotube coating, optical engineer John Hagopian, a contractor at NASA’s Goddard Space Flight Center in Greenbelt, Maryland, and Goddard scientist Lucy Lim are growing an array of miniscule, button-shaped bumps of multi-walled nanotubes on a silicon wafer. The dots, which measure only 100 microns in diameter — roughly the size of a human hair — would serve as the “ammunition” source for a mini-electron probe. This type of instrument analyzes the chemical properties of rocks and soil on airless bodies, like the Moon or an asteroid. Although the probe is still early in its technology development, it’s showing promise, said Lim, who is using funding from NASA’s Planetary Instrument Concepts for the Advancement of Solar System Observations Program, better known as PICASSO, to advance the concept. Key to Lim’s instrument, of course, are the carbon nanotubes, which are excellent electron emitters. Discovered in 1991, these structures also exhibit an array of useful electronic, magnetic and mechanical properties. For the electron emitter, Hagopian and Lim are using this technique to grow tiny, circular dots of carbon nanotubes in a grid pattern that Goddard’s detector branch fashioned using photolithography. Positioned above and below the lattice of dots are silicon wires or traces and a grid that produce two different voltages. These voltages create an electrical field that activates the release of electrons contained within the carbon-nanotube bumps or forests. Under Lim’s instrument concept, the electron beams would then pass through a stack of electrostatic lenses to accelerate their speed and help focus them on an extraterrestrial target. When the electrons hit the sample, the bombardment would excite the elements contained within the sample, producing X-rays that a spectrometer would then analyze to identify the sample’s chemical make-up. Although NASA has flown other instruments that analyze samples using X-rays, Lim’s concept and her use of carbon nanotubes could offer significant improvements. 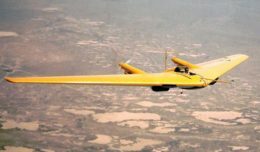 The team, which also includes Larry Hess with Goddard’s Detector Branch, is closing in on the technical challenges and knows the nanotechnology works as envisioned. However, obstacles remain, said Hagopian, the founder of the Lanham, Maryland-based Advanced Nanophotonics. Packaging the nanotube-based grid into a tiny package and then hooking it up to the instrument’s electronics “is difficult,” Hagopian said. However, the team believes it can demonstrate the nanotube-based electron probe within a couple years under the NASA-funded research effort. These images, taken with an electron microscope, show the patterned nanotubes that would operate as electron emitters in a new instrument now being developed for analyzing extraterrestrial samples. The right image is a close-up of one of the bumps. In testing, carbon-nanotube coatings have proven highly effective at absorbing 99.8 percent of the light that strikes them and is the reason why they appear very black. When light penetrates the nanotube forest, tiny gaps between the tubes prevent the light from bouncing. However, these gaps don’t absorb the light. The light’s electric field excites electrons in the carbon nanotubes, turning light to heat and effectively absorbing it, Hagopian said. For researchers at the Space Telescope Science Institute in Baltimore, Maryland, Hagopian is growing intricately patterned nanotubes onto a component that changes the pattern of light that has diffracted off the edges of telescope structures using coronagraphic masks, which block starlight, Hagopian said. NASA’s Small Business Innovative Research program has funded the effort. He also is collaborating with Principal Investigator Antonio Mannino to create a coating that would prevent straylight from contaminating measurements gathered by a new instrument called the Coastal Ocean Ecosystem Dynamics Imager, or COEDI. This hyperspectral spectrometer is being designed to monitor ocean color from geostationary orbit — measurements that scientists and others could use to assess and manage coastal resources.